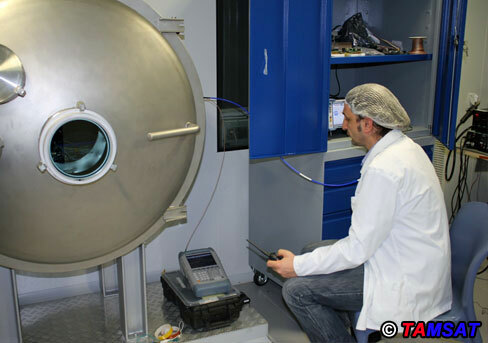 Before the start, the detailed information were given about, the results of the preliminary tests, the TVAC Test Chamber, the specifications of the sensors, the order of the test steps, the logic for them and the limit values to be fallowed. You can see the preliminary test result samples in Fig.1. Figure -1. ITU-USTTL TVAC, some samples from prliminary test results. 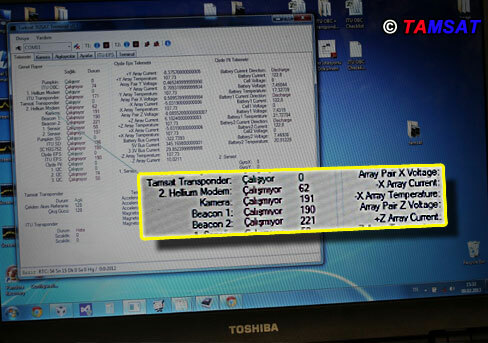 Having these informations, Baris, TA7W prepared the TAMSAT U/V TRANSPONDER connections to be put in TVAC Chamber, as you see in Fig.2. Figure – 2. Preparation fort he TVAC tests. The special software written for TVAC Chamber as shown in Fig.3; which will record all the logs during the test, has been setup by the test team. Figure – 3. The software for logging the test procedure. 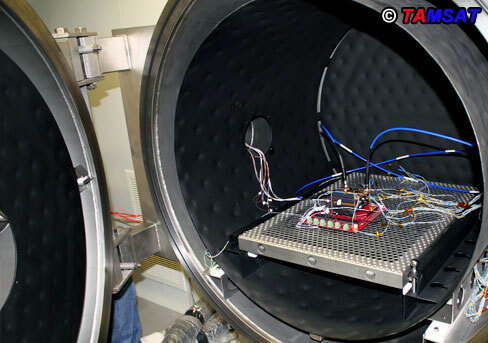 TAMSAT V/U TRANSPONDER which has been prepared fort he test with the sensors has been placed in the TVAC Chamber as seen in Fig.4. and connected to the computer. Figure – 4. 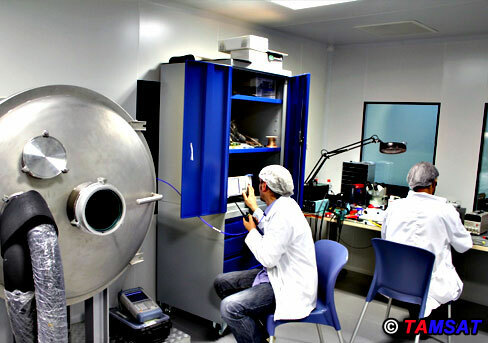 TAMSAT V/U TRANSPONDER in TVAC Chamber. The “CLEAN ROOM” for this test (Class 1000 type) is controlled carefully. It is free from dust and any particles and the test team maintain this conditions. Every team member enters this room using shoe covers/special slippers, head covers and Lab Shirts; passing through two seperate isolated rooms to preserve the constant temperature and humidity. As seen in Fig.5. I followed the test behind the Windows. Figure – 5. Tahir, TA2T is following the tests. The tests will start when the pressure in the TVAC Chamber drops to 10-3 Pascal, and it took 5 hours. This is a long time for Baris, TA7W as you see in Fig.6. Figure – 6. Waiting for 5 hours. At last, the testing conditions were ready; after starting the heating cooling cycles Baris, TA7W started the communications tests as it is seen in Fig.7.. He has a smiley face after seing the results. Figure – 7. Communication tests. Before starting the evaluation of the results logged by the software, the test team is gathered in Fig.8. Figure – 8. 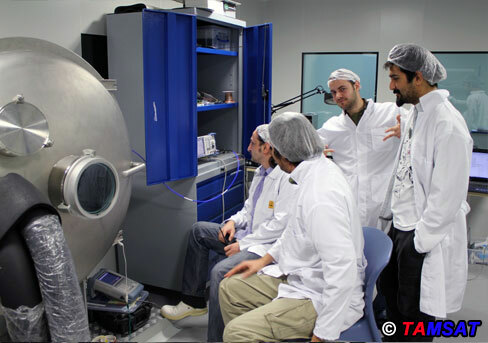 Baris, (TA7W) and ITU-USTTL Test Team. 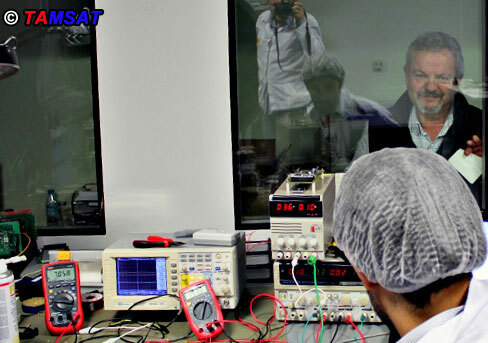 Baris (TA7W), ITU-USTTL Test Team and Tahir (TA2T). After the evaluation of the test logs; they will be presented in another note. We thank all of the participants for this Project and the tests. We are sure that, having these practices and knowledge, the following studies will be completed quicker.